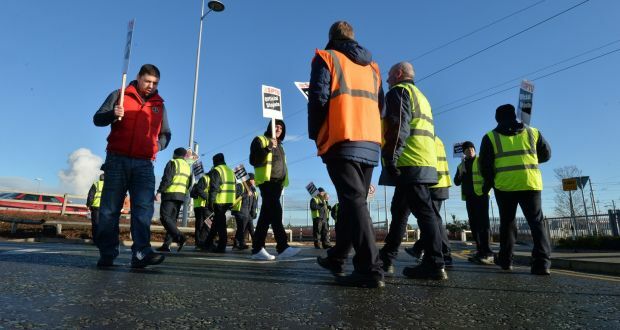 Luas workers continue to show the way in terms of fighting for a recovery for workers, writes Paul Murphy TD. They bravely rejected by 99% a proposal that would have seen the introduction of a two-tier workforce and increasing the working day from nine hours to nine and a half hours. The response of the company, Transdev, has been vicious. Threat has followed threat. 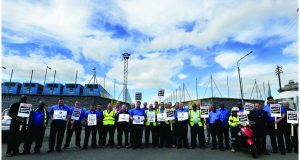 Workers have been threatened with being locked out for continuing industrial action. They were written to directly and threatened with massive financial penalties to pay for the company’s losses – something not even legal within Ireland’s restrictive industrial relations law! The latest threat is that workers’ pay will be cut by at least 10% if they continue with a work to rule. The Luas drivers have become even more resolute in the face of this aggression. They returned to the picket lines on Thursday 28 April, where The Socialist interviewed picketing workers. “I started work with the Luas on 4 January 2004. Like everybody else who started at that time, we were all really interested in Luas wanted to make it a success. At the start, Luas was shocked by the success of it. We all helped to make it what it is now by doing extra hours and helping out. But, while the revenue was far more than their projections, we haven’t got a pay increase since 2011. What’s being put out there about us is not the truth. “The bullying approach is very disappointing. Gerry Madden [the Managing Director of Transdev] has been sent over here to do a job of sorting us out. He was previously with Royal Mail, he made cutbacks, implemented outsourcing there and brought in yellow packs. Now he’s doing it here. If he thinks there’s going to be a split here he’s wrong. There’s definitely no split. The drivers are rock solid together so we are. “We had a meeting with the company the other day, but they just keep saying that drivers are not in a space to negotiate, because our demands are above the WRC recommendation that we rejected. The company is not willing to backtrack on the demand for new entrants to come in at a lower rate or the nine and a half hour shifts. That’s contrary to what Gerry Madden has been saying on the radio. “They issued a letter directly to the members, telling them to question their reps, saying how the workers’ reps have achieved nothing and that they will get less and less. The agenda is clear – to divide and break us, to humiliate us. They are now threatening to cut pay by 10% in punishment for our work to rule. They say they are cutting it because of only part performance of our job. But we are performing our full duties. “It’s all scare tactics. The drivers are the main cog in the system and Madden knows how united we are. At the meeting tongiht, over 160 drivers attended and every signal indicated that all of them are more resolute and determined than ever. They will not succumb to threats and bully tactics and are more united than ever to see this through. Luas drivers have a pay scale which ranges from €29,000 to a maximum of €43,000 after 10 years. This isn’t a high wage when the cost of living and the profits of the multinational Transdev, that operate Luas, are considered. However, because bosses in Ireland have been successful in driving down wages and have created a low-wage economy for many workers this seems like a high wage. The median wage in Ireland is €28,000 but for many workers minimum wage or low paying jobs are the norm. Wages have stagnated in Ireland while profits have soared by 30% and the share of GDP going to profits rather than wages has increased. The Luas drivers are portrayed as being greedy for seeking their pay rise. The idea that they need to lower their demands to what is being put across as ‘reasonable’ levels is being touted by big business. Bosses in Ireland are engaged in a race to the bottom in wages. They want to keep wages down. This was emphasised by IBEC’s calling the measly 50c increase on the minimum wage as a ‘mistake’. If bosses are going to be forced to give pay increases they want them to be minimal to protect their profits, that’s why it is imperative for them to portray the Luas drivers’ demands as outlandish. They want to instil in workers that they must be ‘sensible’, otherwise there could be a risk to the supposed ‘recovery’, this is just an excuse to hold back workers’ demands and to protect their profits. 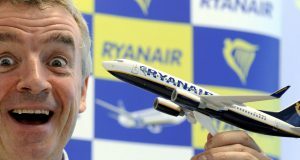 Transdev’s profits internationally have soared over the last year – their attributable profits from Ireland more than tripled from 2014 to 2015 from €24 million to €82 million. The workers are demanding a share of these profits. During the strike, memes have appeared comparing Luas drivers’ pay with that of nurses and doctors and portraying them as more ‘deserving’ of pay increases. This is a classic “divide and rule tactic” of the bosses that we must not accept. We should not fall into the trap of seeing one type of work as being more valuable than another type of work, all workers deserve decent pay and conditions. Nurses and teachers, particularly new entrants, have had their pay slashed over the last number of years and a two-tier workforce introduced with new entrants getting less pay. Of course, nurses and doctors should be paid more but it is not a situation where if Luas drivers get paid more that nurses then lose out. In fact, if the Luas drivers are victorious it will increase the pressure on the government to restore nurses pay. One of the key reasons why the drivers rejected the offer from the WRC was that it created a two-tier work force with lower pay for new entrants, the exact same tactic which was used to reduce nurses pay. 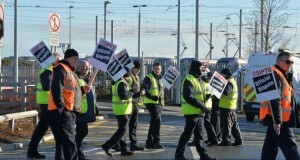 The Luas workers have taken a stand against this race to the bottom by refusing to accept new workers getting lower pay. If the Luas drivers win it will increase the pressure on the nurses’ unions who accepted the two-tier system to put up a fight against it.